The City of Kenmore is proud to announce that John Vicente, P.E., P.M.P., was officially named City Engineer in August 2018. John was originally hired in March 2015 to manage the West Sammamish River Bridge Project. 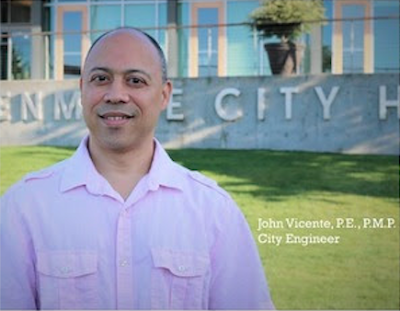 Over the last few years, John's scope has expanded to oversee other critical capital projects including SR 522 enhancements, multiple sidewalk and bike lane projects, and the Town Square and Hangar building. As Acting City Engineer for the last year, John finished the design of the Bridge Project and will oversee the demolition and construction expected to start later in 2019. As City Engineer, John oversees all transportation capital projects, including two of the five Walkways and Waterways projects approved by Kenmore voters in November of 2016. These two projects are the future new sidewalks and bike lanes on 68th Avenue and Juanita Drive. John also supervises traffic engineering, the engineering review of private development applications, permits for accessing the city’s right-of-way, among other responsibilities. 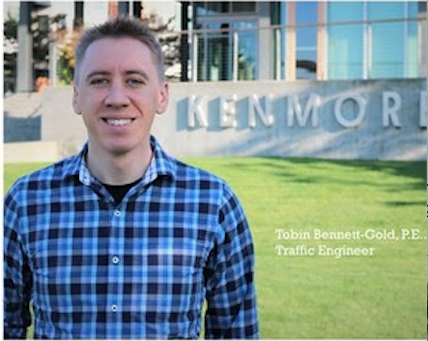 This month Kenmore also welcomed Tobin Bennett-Gold, P.E., as the new Traffic Engineer. Tobin comes to us from Pima County Department of Transportation in Arizona and will work hard to deliver traffic safety and roadway improvements for pedestrians, cyclists, and drivers. Understanding the priority we place on Target Zero, Tobin is excited to start working with our community to identify, analyze, and implement design solutions that make our streets and neighborhoods more safe and efficient for all modes of travel.